Experience a top-of-the-line performance with this Intel Core i5-8400 Processor. Having this processor will give you excellent performance when you need it most even in the most demanding applications. The Intel Core i5-8400 Processor is a 64-bit hexa-core that is suitable for multiprocessing environments. It operates at 2.80GHz with a TDP of 65W and a Turbo Boost frequency of up to 4.0GHz. With its Virtualization Technology, it provides improved manageability by limiting downtime and maintaining productivity by isolating computing activities into separate partitions. In addition, it supports Intel Optane Memory which is a non-volatile memory that sits in between system memory and storage to accelerate system performance and responsiveness. 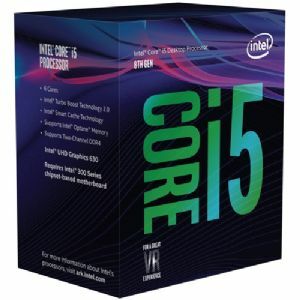 Buy Intel Core i5-8400 Processor now!